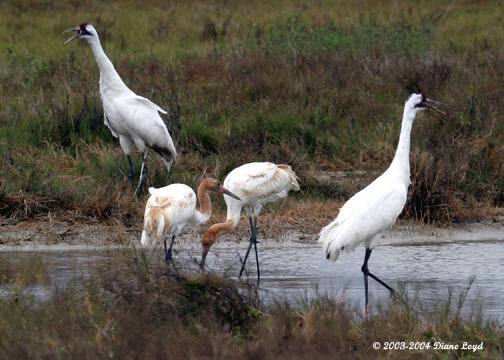 During November, cranes are arriving on their wintering grounds on the Gulf Coasts of Texas or Florida. The best winter habitat for cranes has marshes where cranes can find lots of blue crabs, their most important food. Each family wants to claim a prime place for finding blue crabs. Cranes will move to other territories if necessary to find food, but would rather hunker down. Crane parents must teach their young how to find and eat blue crabs, which don't exist on their northern nesting grounds. The juveniles stay with their parents throughout the winter. They learn the landscape of their wintering grounds and how to find food that's fit for cranes.